Well, it’s a new season… Now what? I guess it’s time to dive into my definitely-not-metaphorical bag of article ideas. Oh, “good in EDH” the title bestowed upon pretty much any card that isn’t playable in any other constructed formats… I’ve come across a few of these in the Theros spoiler season, and I’ll admit to using the term more often than I should, but I think it extends beyond just the playability of cards among various formats. The other day a friend of mine (primarily a modern/standard semi-competitive player) brought up a few things that he “doesn’t get” about the format. Not necessarily things that are “good in EDH” but things that are good, or at least acceptable, to do that feel wrong to him coming from his formats of choice. This is the first thing he mentioned casually after a particularly drawn out game of “I’ve already won, but I’m just going to sit here until you kill me.” He had been playing my Thraximundar deck and had kept a fairly slow hand, only making his first four or so land drops. 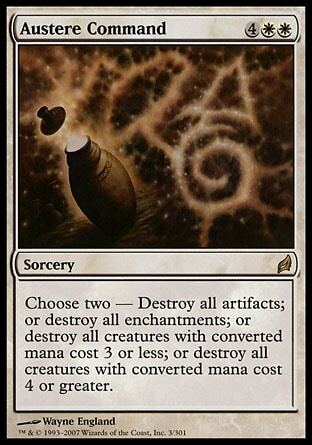 After making those, he realized he didn’t have quite enough for a few of the things in his hand and, instead of waiting to draw into mana, dumped his bombs to a Wheel of Fortune to keep consistent land drops coming. By virtue of being a slower format, some of us end up taking the early game for granted, and I’m no different, I usually go light on my lands (~35-37) for that reason. Sure, lands are important, but when everyone else is spending their first turns just playing lands, if you’re running a lower curve deck, you can go a few turns and safely miss a few lands. This feels like a topic that could be an article in itself, but I’m going to touch on it here. Again, by being a slower format, more spells are playable and their mana costs are more negligible. The tradeoff of power and efficiency is something that’s pretty obvious at times but can also be easily overlooked. So why not take a look at what is simultaneously one of my favorite and most hated cards in Theros. Good in EDH? I don’t know, but I want it to be. 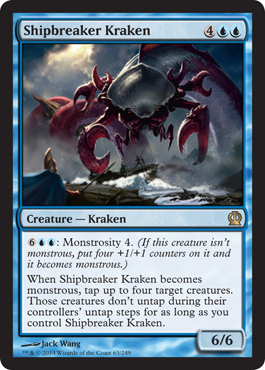 Shipbreaker Kraken, a 6/6 for 6 in blue that becomes a 10/10 and permanently taps down four creatures. Is it efficient? Not in the slightest. (Well, it’s an acceptable vanilla… But when has that ever been a good measure of blue creatures?) Is it powerful? If you get it to stick, yes; being able to lock down the four most powerful creatures on the board AND swing with a 10/10 is hugely powerful. This is the kind of card that gets the “Good in EDH” label slapped on it all the time. On the opposite end of that spectrum is something like Tarmogoyf. For a functionally vanilla creature, ‘Goyf is one of the most efficient cards in the game and an allstar in pretty much every other format. Here, though, no matter how much you pay for it, a vanilla creature isn’t likely to get you very far unless it’s taking the lead of your deck. There are only so many slots that can be filled with wraths, counterspells, and spot removal. Unlike 60card constructed, you can’t deal with everything, especially in a format that is generally political multiplayer. This is one of the things I’ve had my own problems with; I’m a control player, I like having answers. I’ve been getting better though, finding the proper balance of “fun” things and fun-killing things. What makes this part exceptionally hard is color restrictions. You can plan for your own weaknesses, sure, but it’s somewhere between hard and impossible to base your removal package on the rest of the removal in your environment. Do you play what you’re expected to play, what’s good for you, what works for you politically? This is, from what I’ve found, one of the worst aspects of the format for many people. If you’re not building at a competitive level, you’re probably not running a full removal suite. And if you are, you’re hoping the others are wasting their removal on each other so you can hold yours back. While this probably isn’t enough for me to talk about for a full article, I think I might just add a subtle hint that one of our podcasts should talk about it. It’s an answer… But you’ll also be hated for it. So, what do you think are some things to do that are “good in EDH” that you wouldn’t do in other formats? How do you deal with land drops? How do you balance your answers? Blank foil. Black border. I’m not sure what I’m going to do with it, but I can only assume it will end up somehow consumed by one of my decks, and it will be glorious. It was in a pack with an Epic Experiment, so I’m counting it as a mythic.